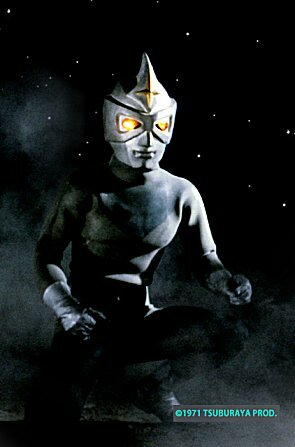 Tsuburaya's first non-Ultra hero series starred Ishida Nobuyuki as Kagami Kyoutaro. Kagami is also the word for mirror. to conquer our planet (No relation to the invaders that couldn't bend their pinkies and were hounded by David Vincent). These invaders send monsters on a weekly basis to stomp around, destroy things and be a general killjoy for humans. To keep tabs on and brainstorm ways of defeating them, Earth uses the Science Guard Members (SGM). The leader of SGM is Professor Mitarai. father from the 2nd Dimension, and a 3rd Dimension mother, but raised by Prof. Mitarai as a foster child. He takes it upon himself to fend off the invading forces and their kaiju, while keeping his true identity a secret. Transformation is only possible with the aid of a reflective surface, such as a mirror, a body of water, plastic, crystal, etc., to which he holds up his Mirror Pendant. He then henshins into Mirrorman with the words "Mirror Spark!" Mirrorman can move anywhere by going into the Mirror World. While Kyotaro's mother is from the Earth (in the 3rd Dimension) and his father is from the 2nd Dimension World, he is not 2-D. There are 3rd Dimensional beings that can move through the 2nd Dimensional world. Mirrorman's finishing strikes are "Mirror Shot", "Silver Cross", "Slicer-V" and "Mirror Knife". Kagami Kyoutaro's regular job is as a photojournalist. 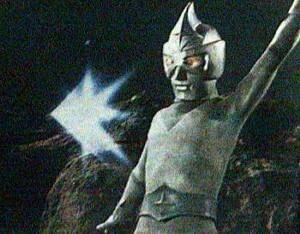 The Mirrorman concept existed quite before its original December 5, 1971 broadcast on Fuji TV. Pre-production was plagued with problems and delays. A pilot was shot, but it bears very little resemblence to the series that finally aired. The costume and production designs were quite different, and the pilot starred Shiba Toshio. 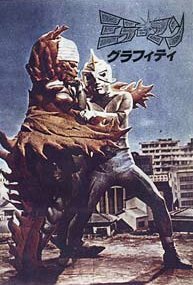 The original concept of the series was greatly geared more towards sci-fi, much like Tsuburaya's Ultraseven, as opposed to the standard formulaic kiddie show hero action. Mirrorman can't even fly, and he must learn his powers as he goes along -- sometimes guided by the voice of his father (the first Mirrorman). The fate of his father, who was defeated by the aliens' monster King Ziger, is explained in episode 14. Moreover, the SGM's role was to investigate and verify. They did not possess the military might of the Ultra Garrison or MAT and such other teams, having to rely instead on intellect, science and cunning to defeat the weekly enemies. MIRRORMAN had a dark edge to its initial episodes. Very much so, with nary a comic moment in sight. This did not sit well with the audiences, who slowly began tuning in to whatever was on other channels, especially SILVER KAMEN. Tsuburaya decided a change was necessary and suddenly Mirrorman became another Ultraman clone. Beginning around episode 26 the look of the show starts a complete change. SGM finally starts getting massive military equipment and weapons. As a result, the show's style changes so much that most episodes of this period are centered more on the combat between Earth and the Invaders. Mirrorman starts appearing less and less as the focus shifts from science-fiction and character development to action. The beginning of this phase is when, on episode 26, the Invaders actually implant into the captured Mirrorman an Energy Time Bomb in his heart. To keep Mirrorman informed when the bomb's time-limit is nearing, his father gives Mirrorman his own version of Ultraman's colour timer. This gimmick succeeds in increasing the tension of Mirrorman's scenes, as he will explode if he keeps that form for too long.. 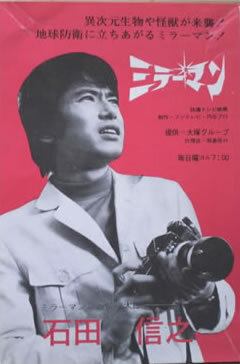 The series lead character, photojournalist Kyotaro Kagami, was played by Ishida Nobuyuki (although I've seen him listed once as Ishida Makoto). Usami Junya played Professor Mitarai Kenichi, Sawai Takako played his daughter, Mitarai Akiko, and Kura Tadayoshi played Akiko's pal, Ogawa Ichiro. 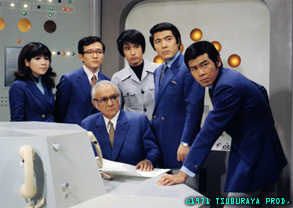 The SGM team is comprised of Wazaki Shunya as Chief Murakami Hiroshi, Kudo Kentaro as Fujimoto Takeshi, Sugiyama Gen as computer specialist Yasuda Takeshi, Ichiji Hiroko as communications officer Nomura Yuki. Kozuki Sachiko played the role of Kyotaro’s mother, Kagami Yuko. Kozuki also played Sakimori Tsukiko/Zone Mother in Toho’s superhero series METEOR MAN ZONE (known in South America as METEOR ZONE FIGHTER, also the title on the HK VCD. Original Japanese title: Ryusei Ningen Zone, 1973). This information was provided by August Ragone of Henshin! Online (http://www.henshinonline.com). 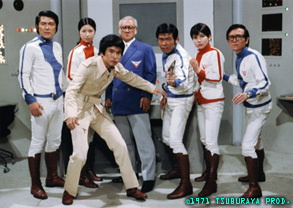 Some characters and actors from MIRRORMAN later crossed over into JUMBORG ACE (1973), another Tsuburaya Productions show. In Episode 32 of JUMBORG ACE, the leadership of PAT (Protective Attack Team) is taken over by the SGM’s former Chief, Murakami Hiroshi, who brings along SGM officer, Nomura Yuki. In Episode 43, a SGM’s Yasuda Hidehiko joins PAT, taking the place of officer Oba Kenji, who is killed in the previous episode...In Episode 44, Chief Murakami is awarded his own PAT uniform. Mirrorman himself, Ishida Nobuyuki, appears in Episodes 12 and 13, as a completely different character, Kishi Kyoichiro. The MIRRORMAN series was supervised by Director Honda Ishiro, famous for his work in GODZILLA movies. There was a second series, a short episode series titled Mirror Fight, which broadcast on TV Tokyo from April 1 to September 27, 1974, with a total of 65 short-episodes. It was similar in concept to the earlier Ultra Fight. This was shown again on TV Tokyo 12, in 1994. Tsuburaya had planned a complete new franchise with Mirrorman, expanding the concept into a Mirrorman Family not unlike the Ultra Family. However, viewer indifference placed those plans indefinitely in the backburner. 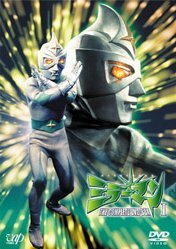 Revived interest in tokusatsu heroes and the recent success of Tsuburaya's latest batch of Ultraman movies brought along the filming of a new Mirrorman theatrical release. The movie, titled MIRRORMAN REFLEX is currently in production. There is a MIRRORMAN DVD BOX SET now available. [Mirrorman] - Theatrical version of episode 1, "Mirrorman is born! ", aired in the Toho Champion Festival, March 12, 1972.